Fan culture, or fandom, is a term which describes communities built around a shared enjoyment of an aspect of popular culture, such as books, movies, TV shows, bands, sports or sports teams, etc. Fan cultures are examples of participatory cultures. Participatory cultures involve fans acting not only as consumers but also as producers and creators of some form of creative media. Though most fan cultures, including sports fans and fans of music groups, have elements of participatory culture, media fandom in particular encourages creative expression and artistic production by its participants. Fans at an Anime Expo, a fan convention held in Los Angeles. In fan cultures, these creations and artistic expressions take the form of fan fiction, fan art, fan videos, cosplay, filk songs, and other interactions with a person, group, or fictional universe. Fan fiction consists of stories written by fans of a particular work of fiction (rather than the original creator) about the fictional characters or universe. Fan videos, or fanvids, set clips of a movie or TV show to music and/or construct a narrative using clips from multiple source materials. Filk songs are a type of folk music, usually with science-fiction, fantasy, or other fictional universes as the subject. 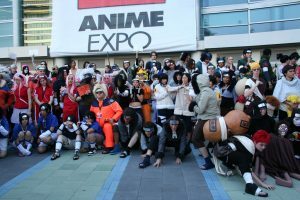 Cosplay is the practice of wearing costumes or other clothing and accessories in an attempt to portray a fictional character. Modern fan culture originated with Star Trek fandom in the 1960s (Helleckson and Busse, 2006). 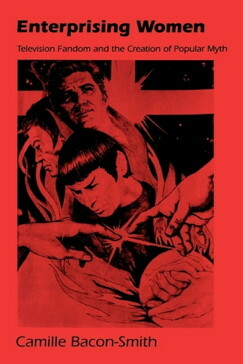 At the time, fans generally spread their creations through fanzines or conventions. 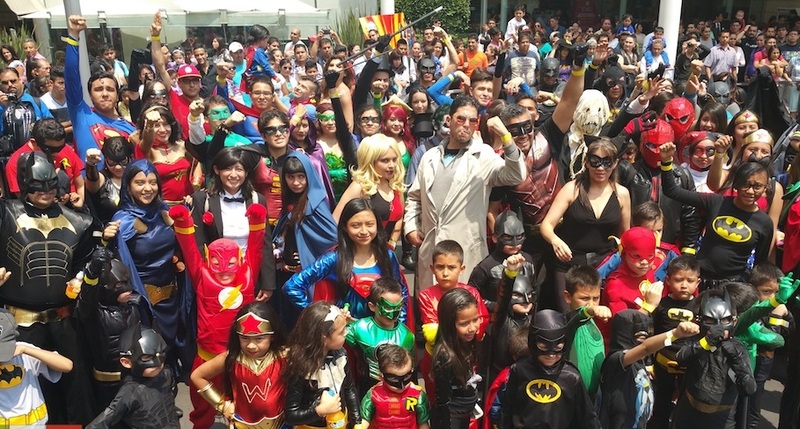 Recently, the Internet has allowed fan culture to become more widespread and more accessible. Rather than submitting a work of fan fiction to a zine where, if accepted, it would be photocopied along with other works and sent out to a mailing list, modern fans can post their works online. Media scholar Henry Jenkins contrasts participatory culture with consumer culture, suggesting that fans “poach” from popular media, appropriating ideas from the text and rereading them in creative ways for their own uses. One theory of popular culture holds that the corporate “culture industry” (media producers such as TV networks and film studios) prioritizes profit at the expense of quality, and that pop culture is a form of hegemony, used to spread dominant ideologies. However, the theory of participatory culture suggests that rather than being “cultural dupes, social misfits, and mindless consumers,” media fans can be understood as “active producers and manipulators of meaning” (Jenkins 1992:23). Fan interaction with media becomes a social activity, and this process allows fans to build their own communities in which they can express themselves. In doing so, they create spaces where they can critique prescriptive ideas of gender, sexuality, and other norms promoted in part by the media industry. Jenkins also theorizes that participatory culture can be a form of resistance. For example, fan fiction, fan videos, and filk songs often explore themes and aspects of the source material which are of interest to the female-dominated parts of the fan community, going beyond the stories the male-dominated media industry is interested in or willing to tell. He suggests that “fandom’s very existence represents a critique of conventional forms of consumer culture” while also providing “a space within which fans may articulate their specific concerns about sexuality, gender, racism, colonialism, militarism, and forced conformity” (Jenkins 1992:283). Not only do fans actively generate their own creative material, but they often do so in ways which critique the media they are consuming. Social hierarchies exist between and within fan cultures, which can lead to judgment. Members of any subgroup tend to have a general consensus regarding which behaviors are acceptable, i.e., which behaviors constitute true fans or desperate overconformers. This dynamic is represented in the geek hierarchy. While members benefit themselves by displaying commitment, “too strong an investment is threatening even as that very affect is what centrally defines fans and geeks”(Busse 2006:79). For example, a Star Trek fan who goes to a fan convention might consider herself more geeky than someone whose involvement with the show ends at watching it, but less geeky than another Star Trek fan who speaks Klingon (a language of one of the show’s alien races). Defining a place for oneself in fan culture depends on navigating the fine line between professionalism, consumerism, expertise, and commitment. Participation in fan culture is often gendered, and a given fan activity’s place in internal hierarchies is often correlated to the gender of the participants. For example, the vast majority of fanfiction writers are women (Coppa 2013). Generally, ‘transformative’ activities – such as creating fan fiction, fan art, fanvids, etc – are associated with female fans. Conversely, ‘curative’ or ‘affirmational’ activities, such as memorizing trivia or collecting merchandise, tend to be associated with male fans. Though the two types of fan activity are not mutually exclusive, and though people of all genders engage in any given form of activity, the gendered stereotypes associated with each type of fandom is reflected in whether those who engage in those activities are treated as ‘serious’ fans. Henry Jenkins writes that “the largely female composition of media fandom reflects a historical split within the science fiction fan community between the traditionally male-dominated literary fans and the newer, more feminine style of media fandom” (1992:48). This split is reflected in the creative output produced by (primarily female) fans: fan fiction often brings female experiences into source texts which are generally written by and about men, often challenging norms of gender and sexuality. In her article on geek hierarchies and gendering, Kristina Busse (2013) delves further into how gender informs the perceptions of particular fan behaviors. Not only do certain branches of the subculture such as those engaged in fan fiction become coded unfavorably towards a particular gender, but the way in which media depicts female fans casts them in a desperate and disgraceful light. Busse describes how the television program Supernatural, whose fanbase is primarily female, depicts gender bias in its representation of a particular female fan at a convention in episode 5×09. Rather than granting her character traits such as engagement, curiosity, and commitment, the episode illustrates her as sexually aggressive and obnoxious towards the show’s male subjects. According to Busse, “this mean-spirited and hateful representation of female fans seems strange, and yet it suggests the intended viewer’s subject position as clearly not that of a fangirl”(2013:82). 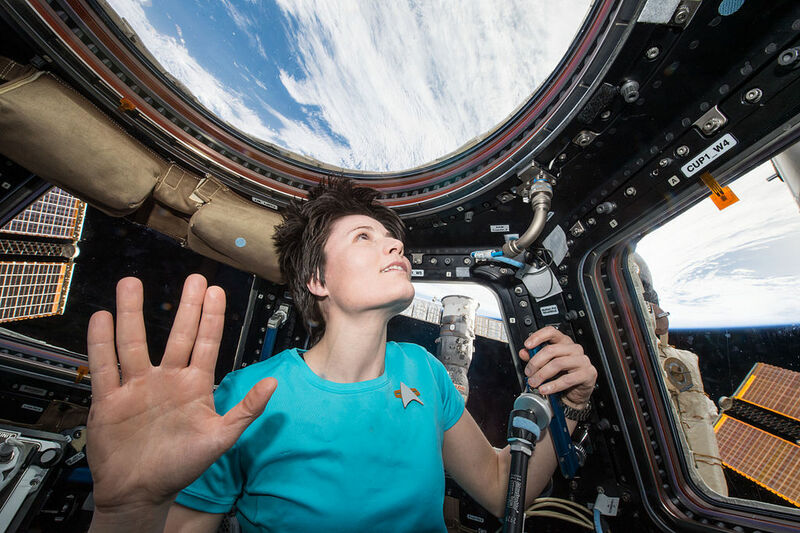 The astronaut Samantha Cristoforetti performing a Vulcan salute while wearing a Star Trek t-shirt. According to Sarah Gatson and Robin Reid, the “default fanboy has a presumed race, class, and sexuality: white, middle-class, male, heterosexual” (Gatson & Reid 2012). 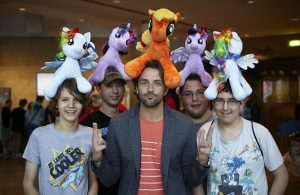 This stereotyped (and often untrue) profile of fandom participants is applied to many fandoms, such as the Brony fandom and science fiction fandom. Why is it that white, heterosexual males, who arguable have the highest status in our patriarchal society, voluntarily choose to lower their social status by participating in fandoms? Mel Stanfill, in his article, “Doing Fandom, (Mis)doing Whiteness: Heteronormativity, Racialization, and the Discursive Construction of Fandom,” argues that one of the qualities of fandom participation is that it is constructed as ultimately “correctable” (Stanfill 2011). The notion of needing to “grow up” is very present in our society, and this is one lens with which society often uses to view participants of fandoms: they simply need to grow up. Therefore, especially amongst white participants, fandom is viewed as a safe way to experiment with a new identity while still having the opportunity to return to the white norms from which they had deviated. Stanfill further states that the overall trend of fans being portrayed as white in popular culture serve to reinforce that whiteness is the expectation for fans (Stanfill 2011). The stereotype of fans as white males is frequently inaccurate. In many fandoms, women rather than men make up the majority of fans (as in the Twilight and The Hunger Games fandoms). In addition, women often make up the majority of a transformative-work-centered subset of fans even for media aimed at men; for instance, women were the primary drivers of the early Star Trek fandom, which is generally considered to be the first modern media fandom. Similarly, many people of color do participate in fandom; however, except in cases where the original source material is non-Western, the existence and contributions of fans of color are often less recognized then those of their white counterparts. A rare vintage comic book, one example of a collectors item that some fans value as part of their authenticity and identity. In his work on fan and participatory culture, Matt Hills examines the interplay between production and the consumerism that fan cultures criticize. Although fandom has generally bifurcated its participants into “a moral dualism of ‘good’ fandom versus ‘bad’ consumption,” Hills argues for a less divided classification of fan culture (Hills 2002). Furthermore, several different fan cultures have turned those who subscribe to traditional workings of capitalism into the other; people who buy too many items automatically lose authenticity by contributing to structures that align too strongly with dominant capitalist society, therefore alienating themselves from supposedly committed fans. Conversely, “we are presented with the view of fans as (specialist) consumers, whose fandom is expressed through keeping up with the new release of books, comics, and videos”(Hills 2002). Therefore, fans must perpetually occupy a space in which they carve out their own unique identity, separate from conventional consumerism but also bolster their credibility with particular collectors items. According to Hills, this negotiation leads to the dichotomy between “use value” and “exchange value,” or the difference between the symbolic significance and monetary worth of an object. Although the two concepts seem based in opposition, Hills argues that they are inherently related and dependent upon one another. Using the example of the popular children’s fable The Velveteen Rabbit, he describes a child’s toy that has undergone considerable wear and tear throughout the years but still holds significance in the eyes of the beholder. While the rabbit no longer contains merit in its capacity to be traded and therefore lacks “exchange value”, the child still deems it valuable because of the emotions and recollections attached. However, Hills then goes on to suggest that fan subculturists must accept such a polarity as an innate contradiction. Instead of “use value” and “exchange value” existing in stark contrast, the two concepts overlap and inform one another. Due to many objects “being intensely subjectively valued by fans, such commodities take on a new ‘exchange value’” that is “created through the durability of fans’ attachments”(Hills 2002). Therefore, participants normally fall somewhere on the spectrum of consumer and producer, creating monetary value with their overinvestment in specific objects while also forming resistance against the typical trappings they find in consumerism. Tasha Turk has discussed fandom as a “gift economy,” based not on money or on explicit exchanges of goods or services, but on giving, receiving, and reciprocating. She argues that the process of gift exchange “is part of what makes it possible to experience and analyze fandom as a community, or rather an overlapping series of communities, rather than simply a large and shifting number of people occupying the same affinity space” (Turk 2014). In fandom, Turk argues that the most valued gifts are those which take time and/or skill to create. The value of those gifts, then, “lies not simply in the content of the gift, nor in the social gesture of giving, but in the labor that went into their creation” (Turk 2014). According to Turk, fannish gifts include not only the most visible forms of creative output – fic, art, vids, etc. – but the “wide range of creative labors that surround and in some cases underlie these art objects” (Turk 2014). These include commenting on others’ art or writing, volunteering one’s editing skills to help a fanwriter, writing recommendations or reviews, organizing online challenges or exchanges, editing zines, planning conventions, creating websites for fannish activity, etc. The work which goes into maintaining the fandom ‘economy’ is related to the formation of fandom as a community: Turk describes fandom as a system “not just of reciprocal giving but of circular giving” (Turk 2014). Since most of the “gifts” described above are posted online (or published in a zine), not just sent to a specific person, the entire community (or whichever subset is interested) can be considered the recipient of the gift. Turk further relates the concept of “circular giving” to fandom economy by explaining that most fans receive more things than they produce: most read more fics than they write, or watch fewer vids than they create (Turk 2014). This asymmetry, Turk argues, is “critical to fandom’s functioning because it balances out the asymmetry in the other direction: not every gift recipient will reciprocate with ‘the gift of reaction,’” where a reaction might take the form of a comment or a reblog of the work (Turk 2014). This also demonstrates how fans can contribute to the “gift economy,” even if they are not producers, through feedback and redistribution. From this viewpoint, then, fandom’s gift economy is not just an “accumulation of contiguous reciprocal relationships between individuals,” but a “complex system in which the reciprocation of gifts, and by extension the reward for labor, is distributed across the community rather than concentrated in a single transaction” (Turk 2014). 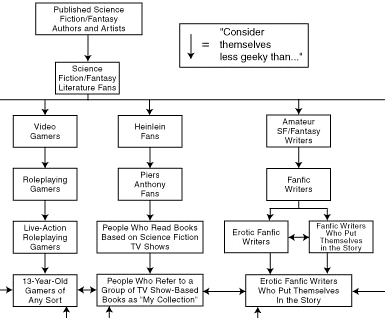 This helps explain why fans choose to participate in the subculture: the value lies not just in the creation of art or writing about their favorite TV show or movie, but in the consumption of those works by other fans, and the sense of community created when gifts are accepted in the form of being read, watched, or otherwise appreciated. The concept of fandom’s gift economy has also been explored by Karen Hellekson. Joli Jensen has addressed the role of class and elitism in fan and participatory culture. She argues that because the word “fan” comes from the word “fanatic,” meaning crazy, there is an “us vs them” divide between fan culture and mainstream society. Once defined as deviant through their fanaticism, those who are a part of fan cultures become characterized as “disreputable, even dangerous ‘others’” (Jensen 1992). Jensen describes two characterizations of pathological fans: the “obsessed loner,” who has been influenced by the media to the point of entering into an “intense fantasy relationship with a celebrity figure” and the “frenzied fan,” who represents the screaming and crying teenagers in a crowd or the “roaring, maniacal sports fan” rioting at a game (Jensen 1992). These characterizations ultimately result in stigmatizing fan culture, as the participants are easily stereotyped. Jensen states that although these stereotypes are not representative of fan culture as a whole, they reveal our beliefs about modern society and our relationship to it. Members of the Brony fandom, known in particular for attracting stigma and the ‘Us vs Them’ divide. Jensen has multiple theories as to the reasons behind the “us vs them” divide. One theory is the “modernity critique” which states that due to the perception of modern society as having loose “communal bonds,” the modern individual is vulnerable to “irrational appeals” (Jensen 1992). Furthermore, society views modernity as the increasing role of mass media in our lives. Those who fall victim to the irrational appeals are manipulated by mass media to essentially display irrational loyalties to an aspect of pop culture. The discreditation of members of fan culture reveals society’s fear of modernity. They do not like the idea of being taken advantage of by a marketing firm or corporation, so they ostracize those who they believe have been. Another theory Jensen describes is the idea that some fans “use fan culture as a form of ‘psychological compensation,’” meaning that fans make up for the lack of fulfillment in their lives with intense focus on fictional realities. However, this psychological compensation does not apply to all members of fan culture, as there is a difference between those fans who replace interpersonal relationships with media-audience relationships and those whose participation in fan culture is supplemental to or aids in making interpersonal relationships. In fact, making interpersonal relationships with those who are a part of the fan culture also aids in fan culture’s participants’ stigma management. Members of fan culture can refute the stereotype of the “obsessed loner” and argue that fandom is a social experience, therefore lessening the stigma associated with fan culture. Even so, in instances of “excessive fandom,” fandoms act as “surrogate relationship[s]” and are often characteristic of socially isolated members of society (Jensen 1992). Jensen states that within fan culture, there are fans, fanatics, and deviants. Whereas fans seek identity and connections with others via a subject, fanatics view the subject as an important aspect of their identity which is integral to their self-esteem. In contrast, researchers state that fans who they have labeled as “deviants” have low self-worth and as a result are prone to “role engulfment,” or the tendency to use the deviance related to fandom as a way to “organize a concept of self” (Jensen 1992). Essentially, Jensen argues that there is a very fine line between being a “normal fan” and “excessive fandom,” and this line is crossed when the difference between reality and fantasy becomes unclear (Jensen 1992). Furthermore, this line is constructed, context dependent. The final reasoning Jensen explains for the “us vs them” divide is that there is an “assumed dichotomy between reason and emotion” (Jensen 1992). Basically, other members of society can be just as interested in a subject as fans, but the subject and the approach to it is what differentiates the two. For instance, as Jensen explains, a person who is passionate about an academic subject can be just as passionate about that subject as a member of fan culture; however, society views academia as a rational interest held by educated, high class members of society whereas society views fandom as an emotional obsession held by uneducated low class members of society which is therefore dangerous. Matt Hills has worked at Cardiff University, Aberystwth University, and the University of Huddersfield primarily as a professor of Media, Journalism, Film and TV Studies, and fandom. He supervises a number of PhD students interested in his areas of study in addition to writing books and articles about fandom and participatory culture. In his first book Fan Cultures (2002), Hills outlines a number of contradictions inherent in fan communities such as the necessity for and resistance towards consumerism, the complicated factors associated with hierarchy, and the search for authenticity among several different types of fandom. Citizen Fan. A 2014 French documentary about fan culture, particularly fan fiction, fanzines, vidding, and cosplay. Watch here (click ‘UK’ for English subtitles). “Furries: What Are They?” A FoxCT special report on the Furry fandom. Contains examples of the positive aspects of the Furry fandom as well as some of the more stigmatized aspects, comparisons to mainstream culture, and the notion that fandom is a phase that can be outgrown. “Inside Comic Con San Diego.” Comic Con 2013 highlights video, includes examples of cosplay, action figures, fan art, merchandise, and more aspects of fan culture. Ringers: Lord of the Fans (2005). A documentary covering the growth of the Tolkien fandom all the way from the original books by J. R. R. Tolkien in 1937 to Peter Jackson’s The Lord of the Rings trilogy. Trailer. Done the Impossible (2006). A documentary about the fans of the TV series Firefly, in particular how fans played a part in getting the movie Serenity made after the original TV show was cancelled. Trailer. Bacon-Smith, Camille. 1992. Enterprising Women: Television Fandom And The Creation Of Popular Myth. Philadelphia: University of Pennsylvania Press. An early study of the fans of Star Trek and other genre television shows with a focus on the female fanzine and fan fiction community. field of fan research and methodological issues. Duffett also attempts to make sense of the debates surrounding other key scholars on issues related to fan culture. Gray, Jonathan, Cornel Sandvoss, and C. Lee Harrington. 2007. Fandom: Identities and Communities in a Mediated World. New York: New York University Press. A collection of essays examining fandom spaces, fandom around the world, the impact of new technologies, and the legal and historical contexts of fan activity. Harris, Cheryl, and Alison Alexander. 1998. 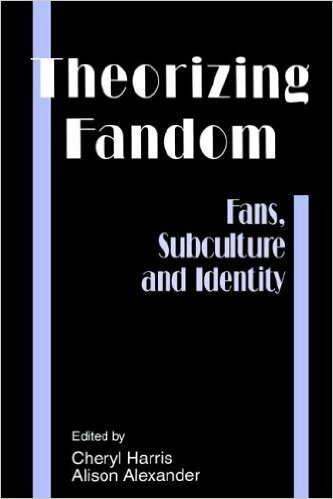 Theorizing Fandom: Fans, Subculture, and Identity. Cresskill, N.J.: Hampton Press. Examines the role of fandom in society by exploring themes such as gender, power, and social class. Hellekson, Karen, and Kristina Busse. 2006. 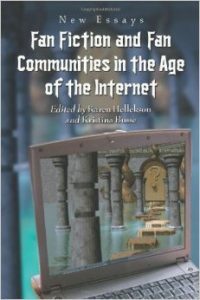 Fan Fiction and Fan Communities in the Age of the Internet: New Essays. Jefferson, N.C.: McFarland & Co. A collection of essays on modern Internet fan fiction communities, covering topics including community, sexuality, and the construction of narratives. Hills, Matt. 2002. Fan Cultures. New York: Routledge. Examines central concepts and theories of fandom such as consumerism, hierarchy, and resistance. 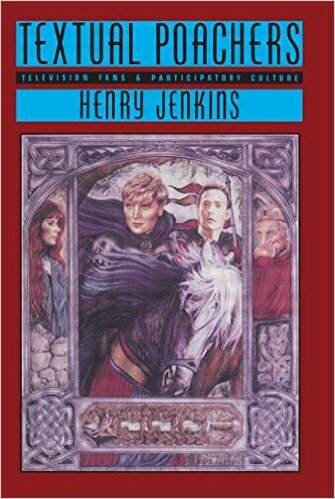 Jenkins, Henry. 1992. Textual Poachers: Television Fans & Participatory Culture. New York: Routledge. An ethnographic account of media fandom community, practices, and relationship to capitalism and mass media. Busse, Kristina. 2013. “Geek Hierarchies, Boundary Policing, and the Gendering of the Good Fan.” Journal of Audience and Reception Studies, 10(1), 73-91. Coppa, Francisca. 2013. “An Archive of Our Own.” In Fic: Why Fanfiction Is Taking Over the World, edited by Anne Elizabeth Jamison. Dallas, Texas: BenBella Books, Inc.
Falzone, PJ. 2005. 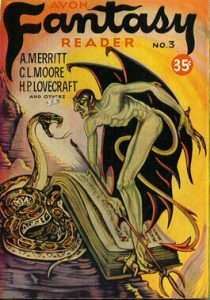 “The Final Frontier Is Queer: Aberrancy, Archetype and Audience Generated Folklore in K/S Slashfiction.” Western Folklore, 64(3/4), 243-261. Gatson, Sarah N., and Robin Anne Reid. 2012. “Race and Ethnicity in Fandom.” In “Race and Ethnicity in Fandom,” edited by Robin Anne Reid and Sarah Gatson, special issue, Transformative Works and Cultures (8). Gooch, Betsy. 2008. “The Communication of Fan Culture: The Impact of New Media on Science Fiction and Fantasy Fandom.” Georgia Institute of Technology, 1-31. Hellekson, Karen. 2009. “A Fannish Field of Value: Online Fan Gift Culture.” Cinema Journal 48(4): 113-118. Jensen, Joli. 2016. “Fandom As Pathology: The Consequences Of Characterization”. Pp. 9-29 in The Adoring Audience: Fan Culture and Popular Media, ed. by. Lisa Lewis. London and New York: Routledge. Lopes, Paul. 2006. “Culture And Stigma: Popular Culture And The Case Of Comic Books”. Sociol Forum 21(3). Stanfill, Mel. 2011. “Doing Fandom, (Mis)Doing Whiteness: Heteronormativity, Racialization, And The Discursive Construction Of Fandom”. Transformative Works and Cultures (8). Turk, Tisha. 2014. “Fan Work: Labor, Worth, and Participation in Fandom’s Gift Economy.” Transformative Works and Cultures (15).